God’s will is a stubborn thing. In this week’s first reading from the Book of Jonah the text begins, “The word of the Lord came to Jonah a second time.” What did God say this second time? The same thing he said the first time: “Go to the great city of Nineveh . . . “. God’s will in this instance wasn’t general but rather very specific. Jonah had rejected God’s call the first time and ended up on the shore of a beach, cold and wet, laying in fish vomit. God may speak to us specifically in certain circumstances. We ought to be listening so that if and when he does we are in a position to respond affirmatively. So then this second time Jonah obeys and goes to the city of Nineveh. 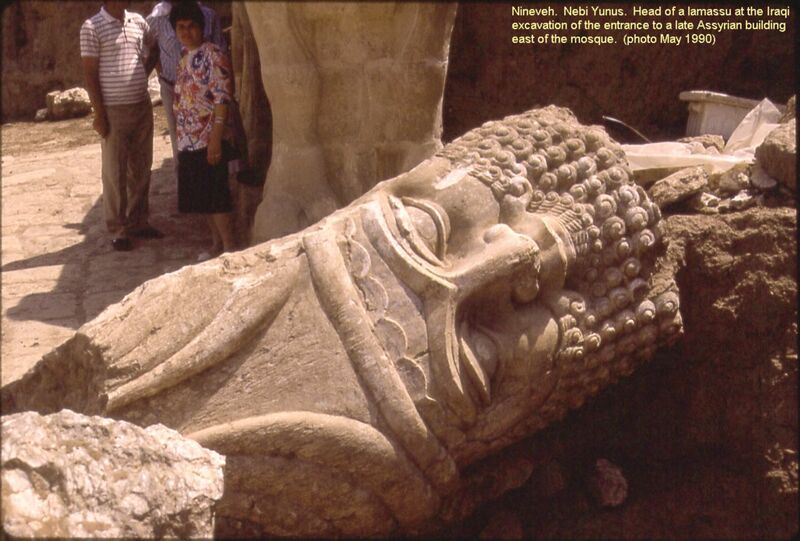 This was a major Assyrian city located just across the Tigris river from modern-day Mosul in Iraq (1). There was great “wickedness” (Jonah 1:2) taking place here. God says, “Let them give up their evil ways and their violence (Hebrew hamas) (Jonah 3:8).” Nineveh was known as a place of self-confident pride (2). One inscription discovered on the wall of King Sennacherib’s palace says this concerning his conquest of Babylon: “Its inhabitants, young and old, I did not spare, and with their corpses I filled the streets of the city.”(3) There was a “We’re number 1” mentality. To those of us who are citizens of the USA this ought to give pause. The message which God gave to Jonah for Nineveh was stark: “Forty more days and Nineveh will be overturned (v. 4)“. Before embarking on the trip Jonah called a couple of church growth consultants who went apoplectic when hearing what Jonah planned to say. However Jonah had learned his lesson: he would say what God had called him to say, and leave the results to God. Remarkably this self-confident and violent Assyrian city listened and response en masse. Why? It seems so unlikely that a foreigner could come in, proclaim this stark message, and have an entire city believe and repent in response. There are several possibilities based on attendant circumstance. First, the Assyrians may have suffered a recent military defeat. Second, a major earthquake may have occurred in the region. Third, on June 15, 763 BC a total solar eclipse over Assyria occurred (4). As we speak the gospel into our own culture we need to remember that we are not alone: God himself will move on our behalf to move our listeners to believing faith. When the Ninevites responded in repentant faith God had compassion on them and withdrew his threatened destruction. God will not tolerate evil and wickedness forever. On this side of the cross, God has made us his final offer in Jesus Christ. If in light of this, we persist in our evil, destruction will be the inevitable result. May we therefore like the Ninevites recognize our own evil, repent both individually and corporately, believe in God, and like the Ninevites become the objects of God’s compassion. Where are you aware of wickedness occurring in your own city whether in its urban areas or suburbs. What might God be calling you to say or do in response? 2) Expositor’s Bible Commentary, Jonah 1:2. 4) New Bible Commentary, p. 820. This entry was posted in Religion on January 17, 2012 by Steve Godfrey.